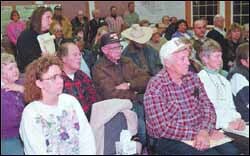 Time is running out for Eureka County residents to have their say about the impacts of the proposed Yucca Mountain nuclear waste repository. The Department of Energy (DOE) has held hearings in Nevada and nationally, including Crescent Valley on December 9 (see article below), on the Yucca Mountain Draft Environmental Impact Statement (EIS). The Eureka County Yucca Mountain Information Office has prepared a comment form to encourage residents to participate. "Just fill it out and send it in to let DOE know how the Yucca Mountain project could affect you, the county, and Nevada," said Leonard Fiorenzi, Project Director. Eureka County is in the process of preparing detailed comments on the draft EIS. DOE is proposing to transport 70,000 metric tons of high level radioactive waste and spent fuel from nuclear power plants and defense facilities to Yucca Mountain, in Nye County. The EIS looks at three modes of transportation for the 24 year shipping campaign – legal weight truck, rail, or rail to heavy haul truck. One rail line under consideration, known as the "Carlin route" would be built from Beowawe southwest through Crescent Valley, and into Grass Valley. South of Highway 50, the EIS proposes that the rail line be built either through Big Smoky Valley or Monitor Valley. The rail line would terminate at Yucca Mountain. At DOE’s Crescent Valley hearing on December 9, all members of the Board of Commissioners and the Planning Commission attended. Commissioner Goicoechea expressed the County’s concerns about a lack of information in the EIS about Crescent Valley itself. He said the document does not contain enough information to choose between truck or train, or among possible rail routes. He also said the EIS lacks basic information on rail such as fencing, and ownership and operation of the rail line. At the morning hearing, Commissioner Green stated the County’s concerns about the potential impacts on property values and future development in the area. Comments must be postmarked by February 9, 2000. DOE is also accepting faxed comments, and submissions through their website at www.ymp.gov. Dozens of Crescent Valley residents said they felt they were being railroaded by the U.S. Department of Energy's plan to construct a rail line through their community to Yucca Mountain. They offered their views during a public hearing yesterday on a draft environmental impact statement. The DOE proposes to ship 70,000 metric tons of high-level nuclear waste from 2010 to 2047 to the Yucca Mountain repository about 70 miles northwest of Las Vegas. Four options for new rail routes are being considered, one of them, called the Carlin route, would branch off from the Union Pacific tracks at Beowawe and run through Crescent Valley and Austin to Yucca Mountain. There is also an option to haul the waste by truck. "If this rail line goes through Crescent Valley, it will put the people here in a no-win situation. If we stay we get nuked. If we leave, we lose our property," said Nancy Louden, who owns the Crescent Valley hot springs. Jamie Gruening of Crescent Valley, clutching a parcel map, said she would live 3,000 to 3,500 feet from the proposed rail line. "How, how much and when would I be compensated?" she asked. "Approximately 12,227 shipments of nuclear waste will come over the Carlin route via the rail scenario," Gruening said. "I can expect 12,227 personal low-level radiological exposures over 24 years." "I'm awfully curious why you'd pitch this area to build a railroad through one of the most highly mineralized areas in America,"" said Elwood Wright. "There's going to be many, many more deposits found in this three county area." "This is a beautiful valley we all love to live in. This railroad will destroy it, in my view," said Lance Paul. "This is a horrendous act of arrogance to think we can safely store radioactive waste for 10,000 years." Carrie Dann, a member of the Western Shoshone tribe, said the DOE should spend its money on finding ways to neutralize the radioactivity of the waste, instead of spending it on Yucca Mountain. "There's so much contamination in this world already, and we're still doing more," Dann said. "If we cannot control the things we created, then those things should not be created at all." "59% of the assessed parcels in Eureka County are within 10 miles of this proposed route." new rail construction project in the U.S. since the World War I era. The construction period could be five to seven years, not 2.5 years as stated in the EIS, considering the difficult terrain, environmental sensibility and high probability of finding Indian artifacts, he said. The EIS lacks information about operating speeds, crew changes, way station requirements and shared use of the rail line, Halstead said. "Nevada is particularly concerned that DOE contractor studies have recommended operating this line without a state-of-the-art computerized train control system. DOE's cost-saving measures include shipping rail casks loaded with highly radioactive spent fuel in general freight trains, which will require switching cars at the connection point. DOE's proposal to routinely park loaded rail cask cars on a side track for up to 48 hours is unprecedented and will result in a separate legal challenge," Halstead said. Eureka County Planning Commission Chairman Ron Rankin said numerous parcel maps have been approved for property lying along the proposed rail corridor, many of them for retirees. The county also spent millions of dollars for infrastructure in the Crescent Valley area and Rankin also had concerns over the emergency response time. "DOE’s proposal to routinely park loaded rail cask cars on a side track for up to 48 hours is unprecedented and will result in a separate legal challenge." County," Eureka County Commission Chairman Pete Goicoechea said in a prepared statement. "The EIS makes little mention of impacts on these people. It does not adequately address the effects of building and operating a rail line so near private property and it does not address the possible stigma effects on property values." DOE representative Jozette Booth told Goicoechea the rail line would not have a tie-in at the southern end to link up to other rail lines, for private users in the area who may want to use it to ship their products. Jennifer Viereck said she had concerns about train safety around the U.S. The waste would be shipped from 72 commercial power plants and five DOE sites around the country. She said 80 percent of the rail crossings in the U.S. don't have signals, there is a rail accident in the U.S. every 90 minutes and a toxic spill every two weeks. Charlie Voos, Elko County community development director, said the Elko County Commission didn't approve a statement for the public hearing, but would submit written comments. The rail line would go through all four cities in Elko County and crew changes would take place in Elko, Voos said. "That means those trains, those hot loads, will be sitting in the downtown area," Voos said. He added, "we've had people killed on our rail lines in Elko County and I know we have many unprotected crossings." The county has begged the railroads to repair right-of-way fencing after the summer range fires, Voos said. "The president told our senators and everybody else he'd veto Yucca Mountain. It looks like it's kind of a moot point," said John Filippini, from Carico Lake Valley. DOE representative Lee Norton said President Clinton merely "wants science to finish before politics sends the waste here." On November 30, DOE released proposed changes to the Guidelines for siting a repository. The comment deadline is February 14, 2000. The Notice of Proposed Rulemaking proposes two actions. The first action amends the original siting guidelines (10 CFR Part 960) so that they apply only to the site screening and selection process leading up to a selection of sites for characterization, not for repositories. This makes the original guidelines no longer applicable to the Yucca Mountain site. The second action is the promulgation of a new set of “Yucca Mountain Site Suitability Guidelines" at 10 CFR Part 963. These guidelines would be used by the Secretary of Energy as a basis for deciding whether to recommend Yucca Mountain to the President for development as a repository. The regulations would formalize the "total system performance assessment" method used by DOE to estimate whether Yucca Mountain will meet EPA individual radiation dose standards over time. This is a change from the existing guidelines which set subsystem requirements such as a groundwater travel time limit. While under the existing guidelines, a site could be disqualified based on any one of a number of conditions, the new guidelines have no specific disqualifiers. Thus, under the proposed guidelines, which permit a "balancing" of favorable and unfavorable conditions, there is no way to disqualify the Yucca Mountain site. DOE will hold public hearings on the Guidelines on January 18 in Pahrump at Terrible’s Lakeside Casino, and January 19 in Las Vegas the University of Nevada-Las Vegas, Marjorie Barrick Museum of Natural History Auditorium, 4504 Maryland Parkway, from 11 am-2 pm and 6-10 pm each day. For more information, call Dr. Jane Summerson at (800) 967-0739. Eureka County has asked DOE to extend the comment period and postpone the hearings due to conflicts with the EIS review period. The Eureka County Nuclear Waste Update is published by the Eureka County Yucca Mountain Information Office, P.O. Box 714, Eureka, NV 89316, (775) 237-5372. The purpose of the Update is to provide information to the public about issues related to the proposed nuclear waste repository at Yucca Mountain. The newsletter is funded by a grant to Eureka County from the U.S. Department of Energy. Articles in this newsletter may not necessarily reflect the positions or opinions of the Eureka County Board of Commissioners.